I discovered something rather disturbing about my husband. I think he's been deceiving me. He is generally an intelligent man. He copes well with life, he seems strong and capable. That is, until he enters the kitchen.....then he becomes a complete wally. I have been trying to teach the teenagers and the oldest child (husband) how to prepare and cook food. Basic things, nothing fancy, just enough so that they would be able to conjure a meal should, god forbid, I had managed to escape from the house one day at feeding time! The other day I was cooking an elaborate meal for the family and I asked for my husbands help. He only had to stir the sauce making sure he got to the bottom of the pan so it didn't burn. Even though he never stopped stirring the sauce - It burnt! - HOW? I have decided its all a ploy. He wants to appear so inept that I'll never ask him to help again, and though that thought is appealing, I am determined to fight on. At present, when we tell the kids daddy's cooking, they shout 'hooray,' go and get the phone and leaf though the array of takeaway menus that he has in his drawer. I'm not looking for Gordon Ramsay (especially with that temper) but for goodness sake why can't he do something simple? 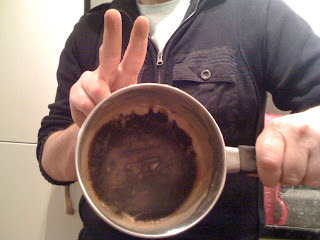 Here he is with that pan, but what is the victory sign for? you've been sussed lil' sweet pea.